Talent is Universal, Opportunities are Not! Today I Read, Tomorrow I Lead, is an early education intervention program focused on elementary school age children at the most challenged schools in urban communities where the achievement gap in education is the largest. Our focus is on supporting and encouraging family and home reading. Learning to read is one of the most important skills in modern society. Not only does reading serve as the major foundational skill for school-based learning, but reading ability is strongly related to opportunities for academic and vocational success. For children, a critical transition takes place during elementary school: until the end of third grade, most students are learning to read. 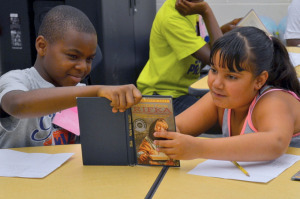 Beginning in the fourth grade, however, students begin reading to learn. Third-grade reading level has been shown to be a significant predictor of eighth-grade reading level and ninth-grade course performance even after accounting for demographic characteristics and how a child’s school influences their individual performance. The goal of Today I Read, Tomorrow I Lead is to increase the number of children reading above level at third grade at the most challenged schools. © Copyright 2017 - Legacy Foundation of Hartford, Inc. | Talent is Universal, Opportunities are Not!